There have been a whirlwind of developments at Four String Brewing Company in the last 6 months. 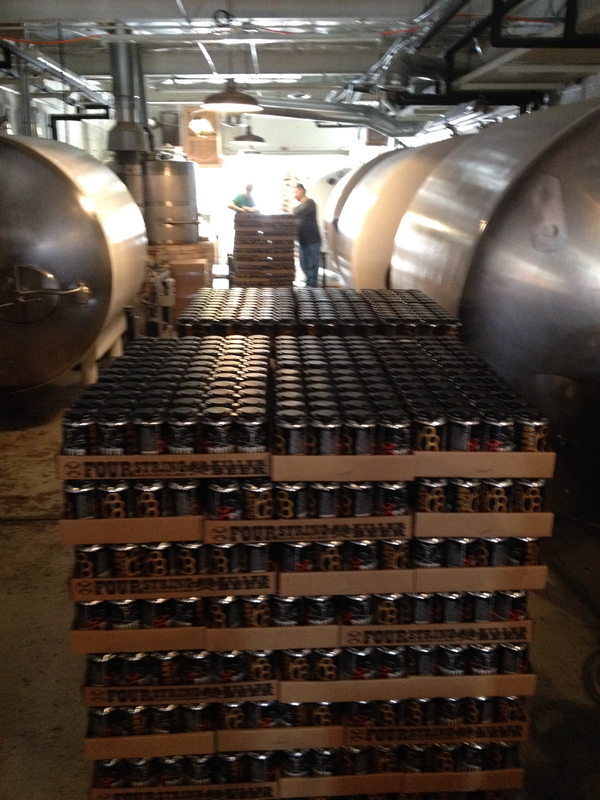 The most recent is the canning and release of their signature beer, Brass Knuckle Pale Ale, to the public. The microbrewery is too small to have a regular canning line or storage for 10,000 plus cans so instead of delaying growth of their brand, they partnered with Buckeye Canning – a mobile canning facility that comes to brewers – to bring the canning line to the brewery. Four String Brewing tweeted that they needed volunteers to help out with the canning line so I signed myself up to learn more about the process. A mobile canning company is a boon to smaller breweries lacking the capital for canning equipment, storage for empty and filled cans and enough space to place the finished product. Breweries contract with the Buckeye Canning to fill 50,000 plus cans. 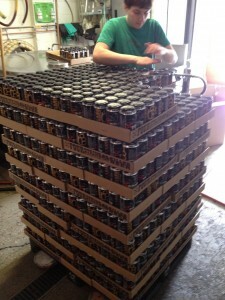 Then artwork for the cans is created, and proofs of the cans are made for review and approval. 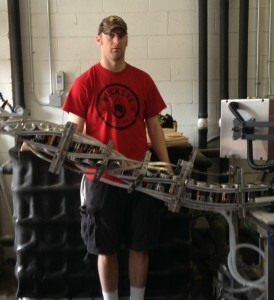 Buckeye Canning comes to the brewery to connect hoses to the maturation or finishing tank. 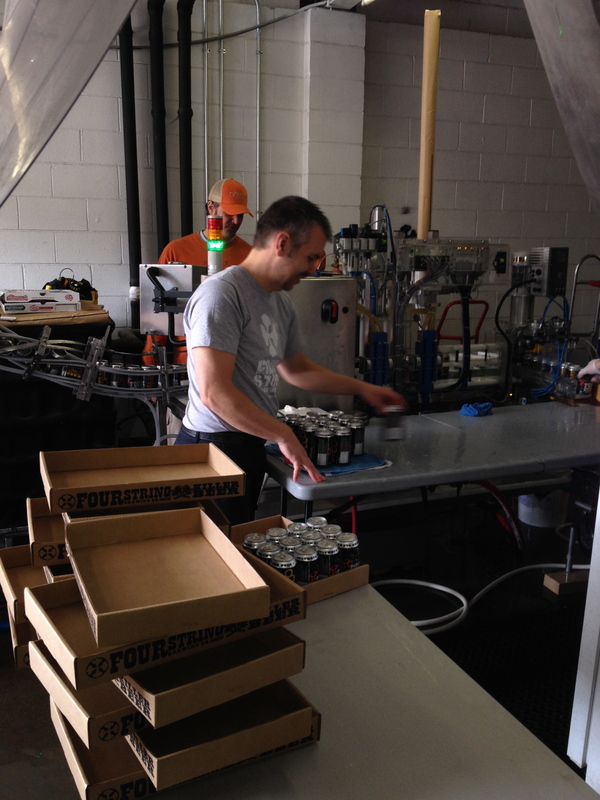 Then they set up the canning line, load up the line with cans ready to be filled and sealed and then the work begins. After about four hours, over 8000 cans are packaged in cases of four 6 packs, ready for delivery to a distributor. We have photos below showing some of the steps in the process. When we visit Four String (on the Grandview Brewery Tour) we speak with owner and brewer, Dan Cochran about how he created his brewery. We learn about how he cobbled together a great brewing system, choose the Four String name, and much more. He shares his story of growing the brewery from an idea to a reality as well as why he decided to have his beers canned. Did you know than beer in a can is considered a better option than beer in a bottle by craft brewers? We talk about these topics and much more throughout the course of a tour.